The photography exhibit that continues through November 6, 2012 at Duke University includes text panels that describe what happens during Day of the Dead. The explanations below are written by Jenny Snead Williams, executive director of Duke’s Program in Latino/a Studies in the Global South. 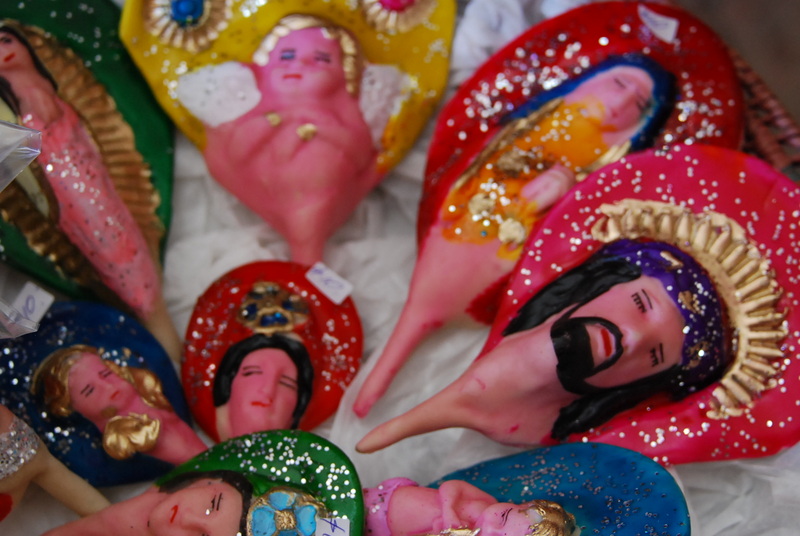 Religious figures decorate pan muerte. Copyright Norma Hawthorne 2012. 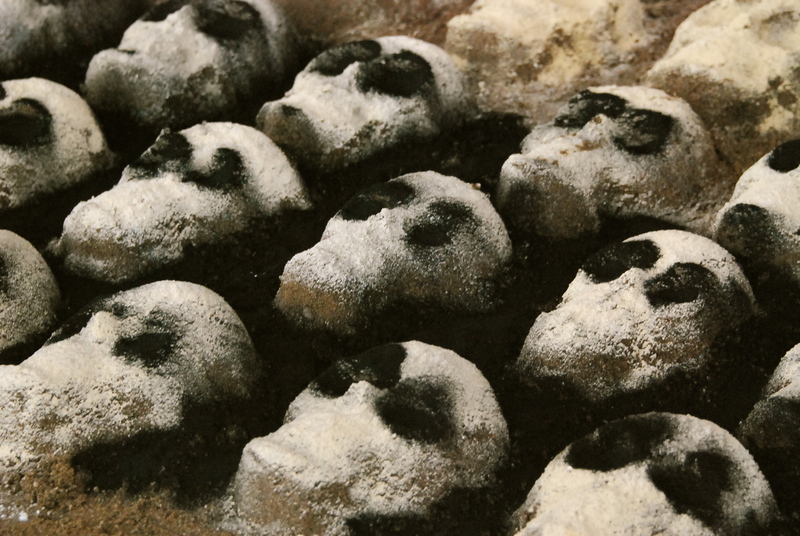 Days of the Dead celebrations take place [in Oaxaca] over a week’s time at the end of October and beginning of November. 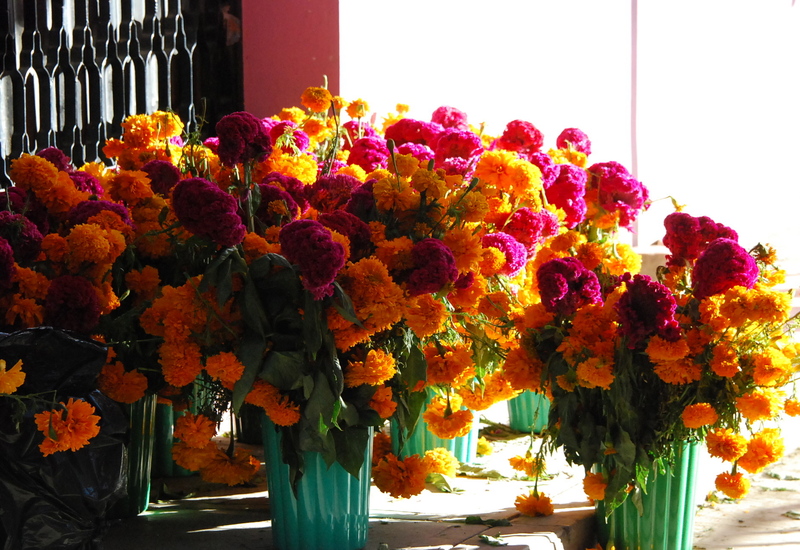 Markets come alive with the mixed aroma of bread of the dead and marigold flowers. Homes in towns and villages are decorated with colorful sugar skulls, skeleton figures made of papier mâché and wood, and with meticulously handcrafted tissue paper decorations. Marigolds for gravesites. Copyright Norma Hawthorne 2012. Finely dressed skeleton figures are prominent due to the popular contributions of José Guadalupe Posada (1852 – 1913) whose skeleton drawings satirized the bourgeoisie class (among others, such as government and church officials). October 31st – November 2nd bring daytime parades and vibrant music, with families and children delighting in their costumes and make-up. Masks of all types abound and are used for dances and playful diversions. Sand sculptures decorate streets and plazas. Copyright Norma Hawthorne 2012. Truckloads of sand are brought to central plazas and cemeteries in many towns, and the multi-day preparations of sand sculptures begin. A large display of skulls partially blocks the road to one of the cemeteries in Xoxocotlán, and painted sand and flower gravesites compete for honors in a public area nearby. Crowds gather in parks as huge two-dimensional shapes of playful skeletons and other figures take form after days of work, finally being “painted” with brightly colored sand. The Days of the Dead photography exhibit continues at Duke’s East Campus, Friedl Building, Jameson Gallery until November 6, 2012. Jenny participated in our 2011 Day of the Dead Photography Expedition. The 2012 program is sold out. Contact Norma Hawthorne to get on the notification list for 2013. Consider coming to Oaxaca January 16 for a Street Photography Workshop with Frank Hunter. Street art, a tribute to the season. Copyright Norma Hawthorne 2012. 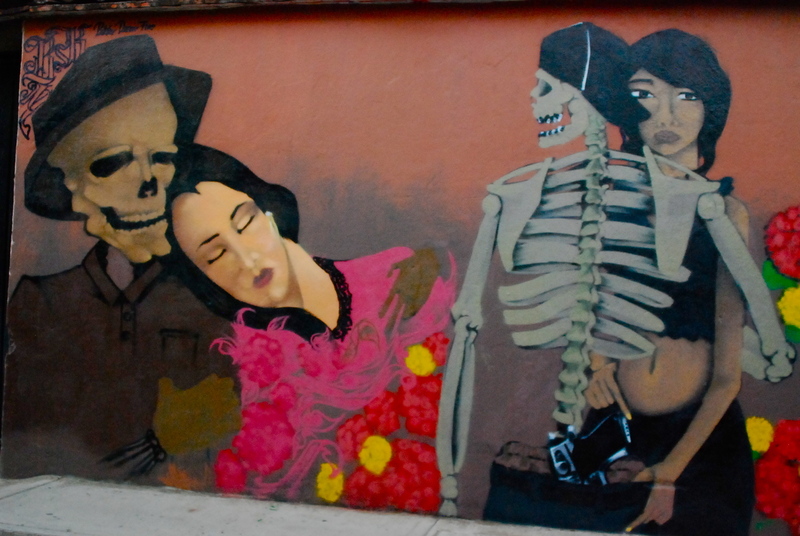 This entry was posted in Cultural Commentary, Photography and tagged blogsherpa, day of the dead, Mexico, Oaxaca. Bookmark the permalink.